truth be told-- I went into panic mode. What?!? My kid had just finished reading the book series and couldn't get enough of the stories. I had never read the books or seen the movies. How was I going to do this? I downloaded a Lord of the Rings front called Ringbearer, from Fontspace. 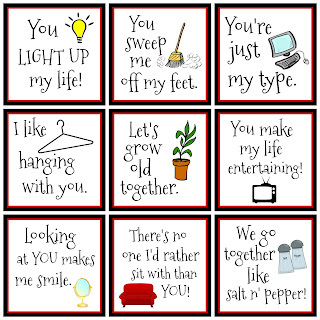 This allowed the invites, party agenda, menus, labels, nametags-- everything-- to come to life! 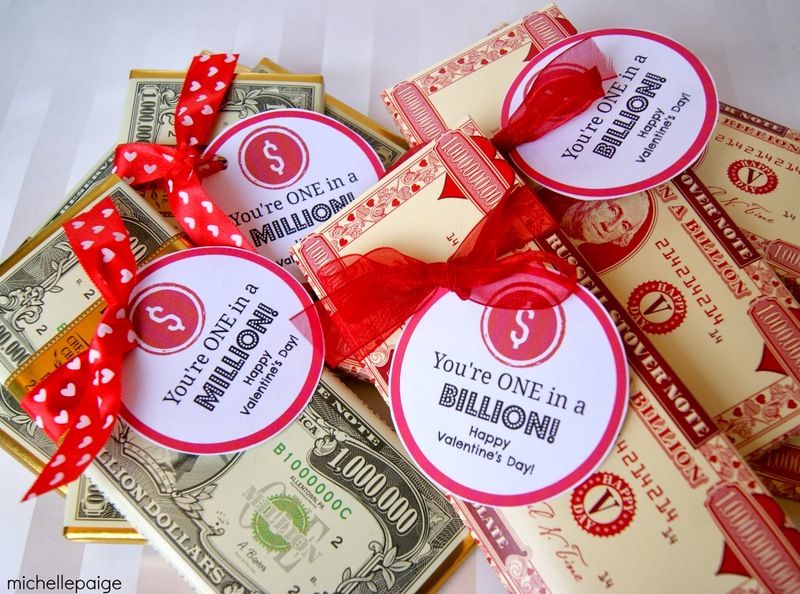 All materials were printed out on brown paper, ripped along the edges and inked with brown ink. Invite inspiration came from here. perfect for 12 year old boys. 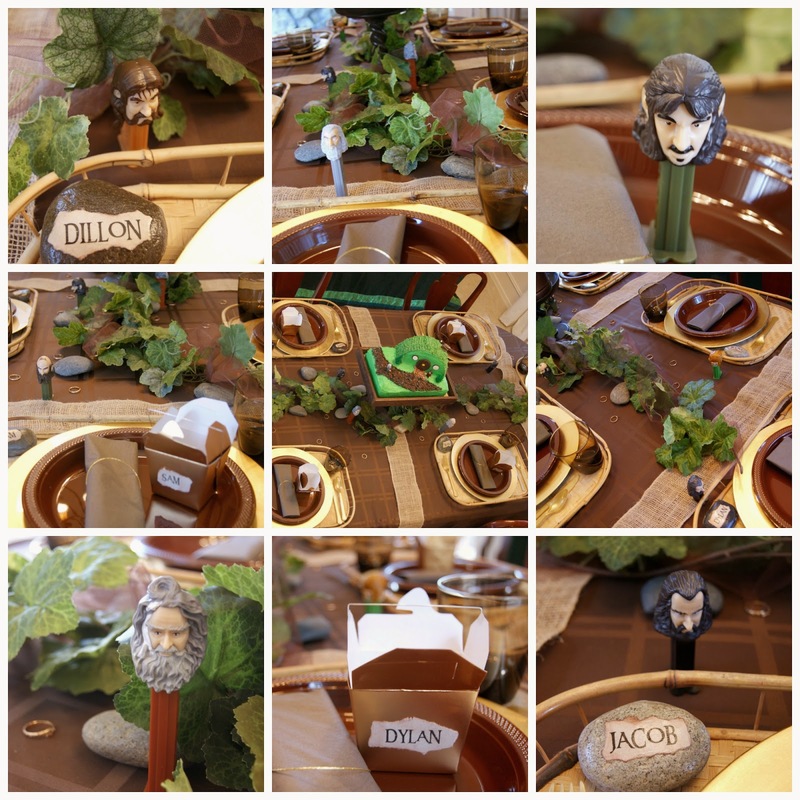 Lord of the Rings Pez figures sat at each place setting. I mod podged the names of each guest onto a stone for place markers. Bamboo trays with gold chargers worked well with the brown plastic plates. 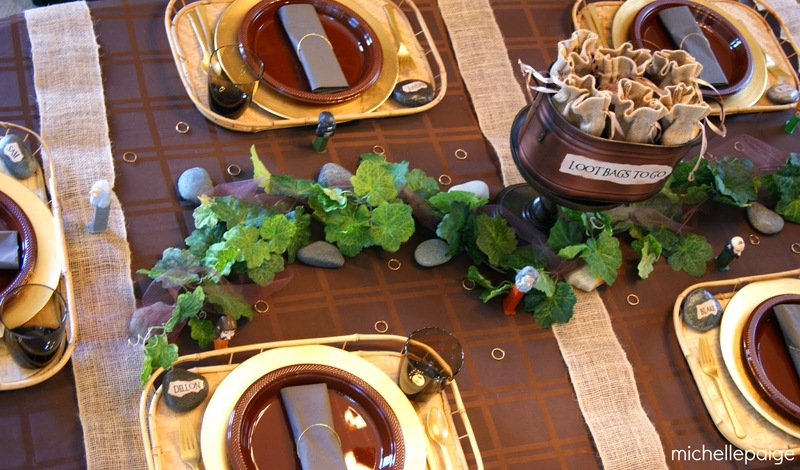 Long lengths of ivy and burlap decorated the table. Gold colored take out boxes were waiting to be filled with goodies. A Birthday Banner was hung. 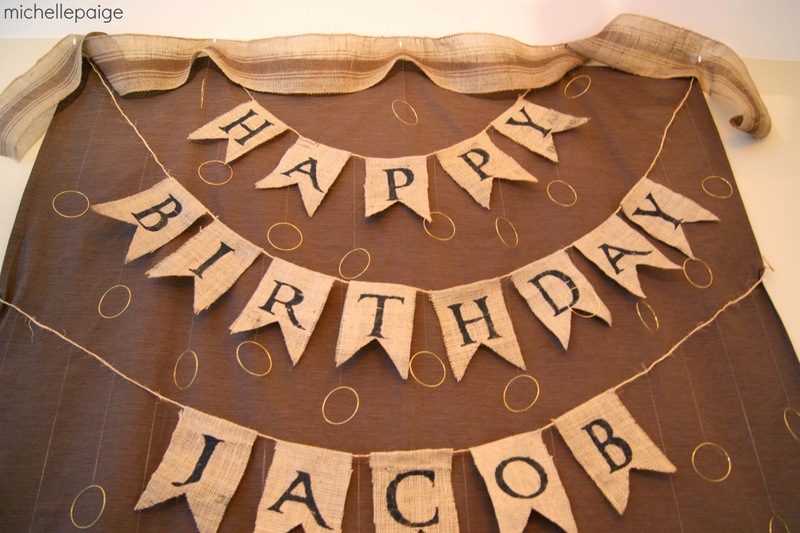 I made this burlap banner with the Ringbearer font. 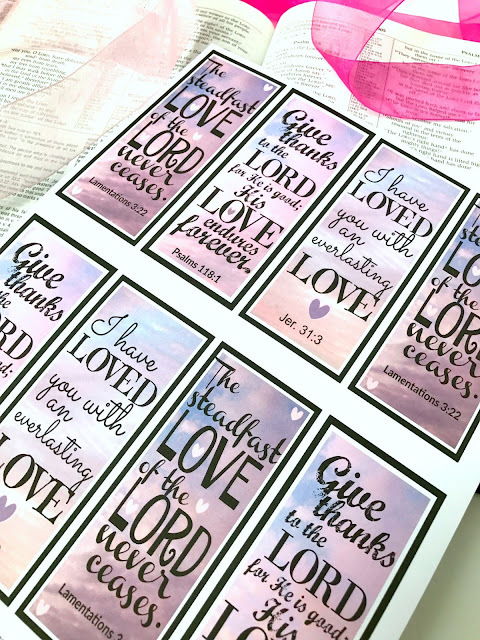 I cut out the stencils on my Silhouette and painted them on the burlap with black craft paint. 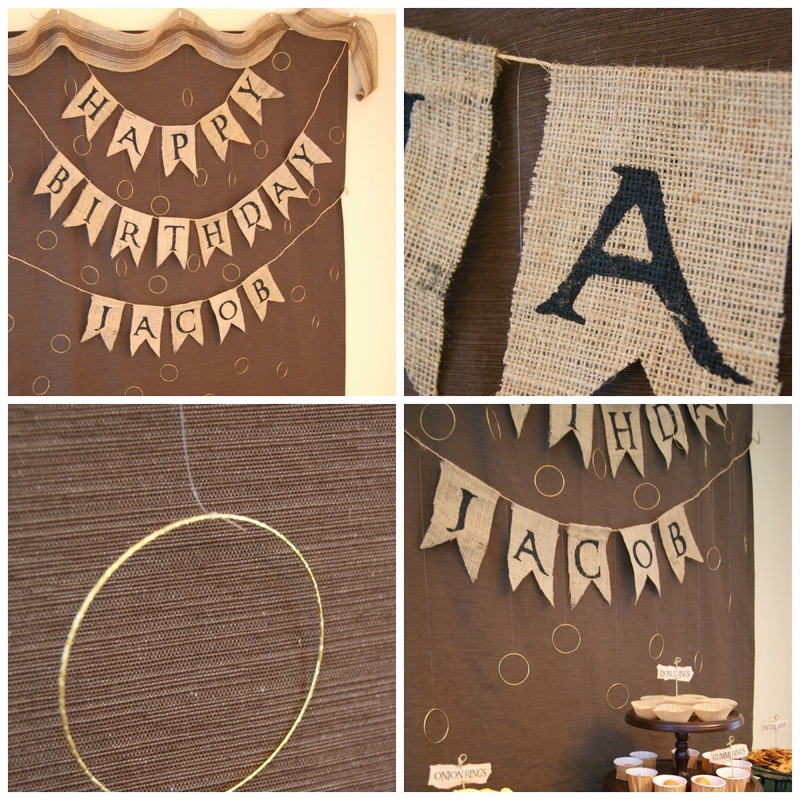 Each burlap pennant was hot glued to the jute rope. 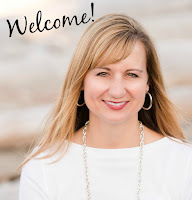 I hung a brown tablecloth for the backdrop using safety pins and Command hooks. were tied onto the jute using fishing line. A long length of burlap hid the Command hooks at the top. 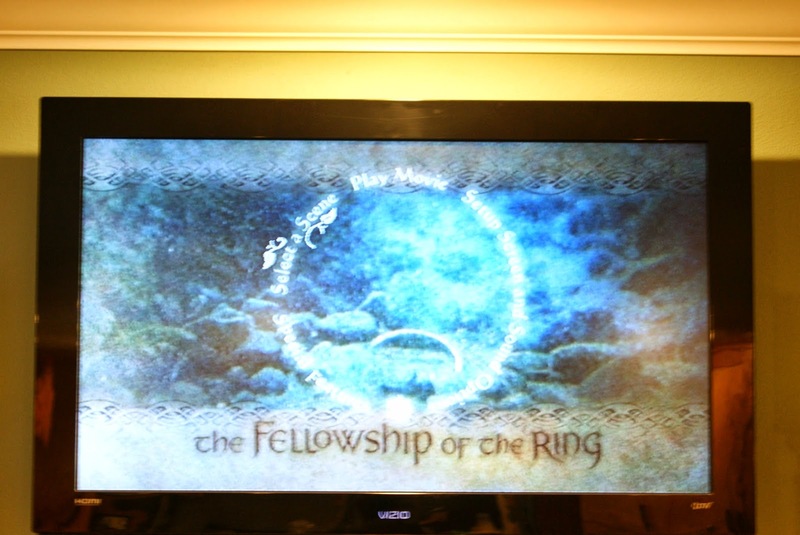 Once the guests arrived, we showed the 7 minute prologue to The Fellowship of the Ring movie. However, most of the kids were very familiar with this story. 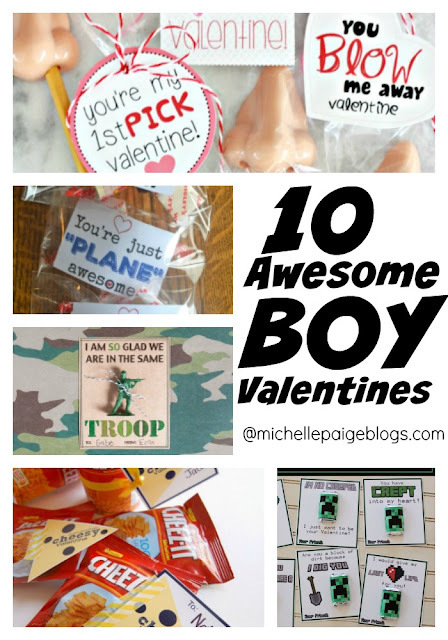 Bows and arrows were found at the Dollar Tree. We tightened up the elastic to make them more secure and added duct tape to secure the handle. Balloons and 'rings' (hula hoops) were hung from the ceiling. 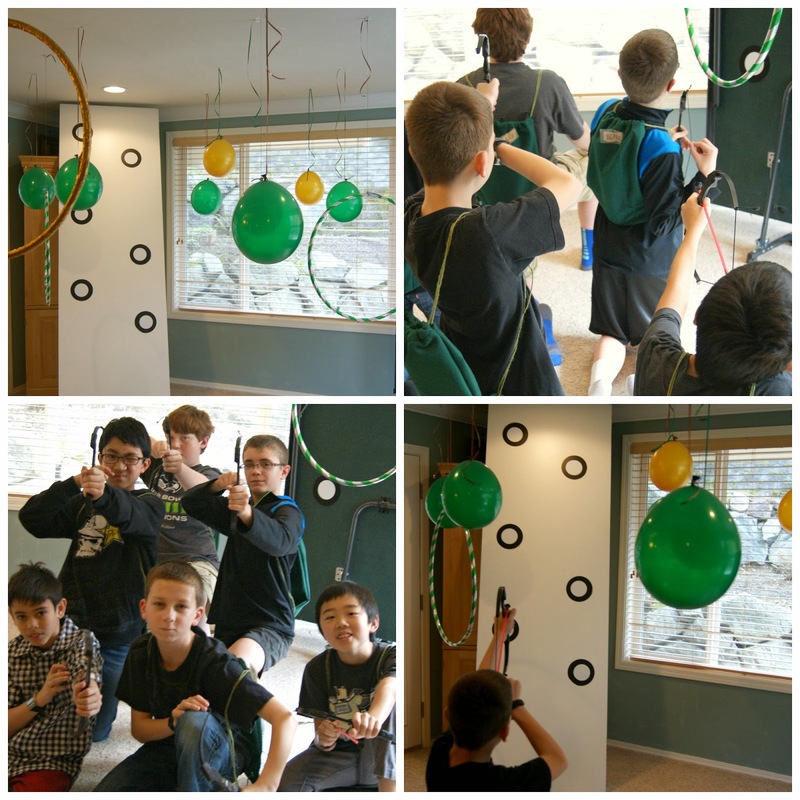 The boys practiced their aim trying to hit the balloons, targets and hoops. The white board with vinyl targets has been such a hit at the last 2 boy parties, that of course we pulled it out again for this one. When handed a bow and arrow, one boy replied, "I just love your parties!" After archery practice it was 11 o'clock. 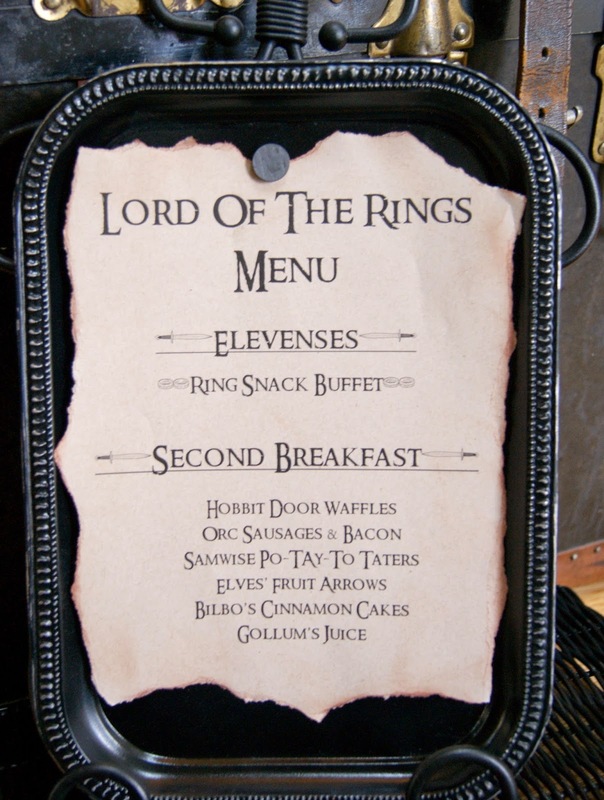 In the Shire (Hobbit land), that means it's time for Elevenses. breakfast, second breakfast, elevenses, lunch, etc. etc. I set out 'ring' shaped snacks for the boys to snack on. 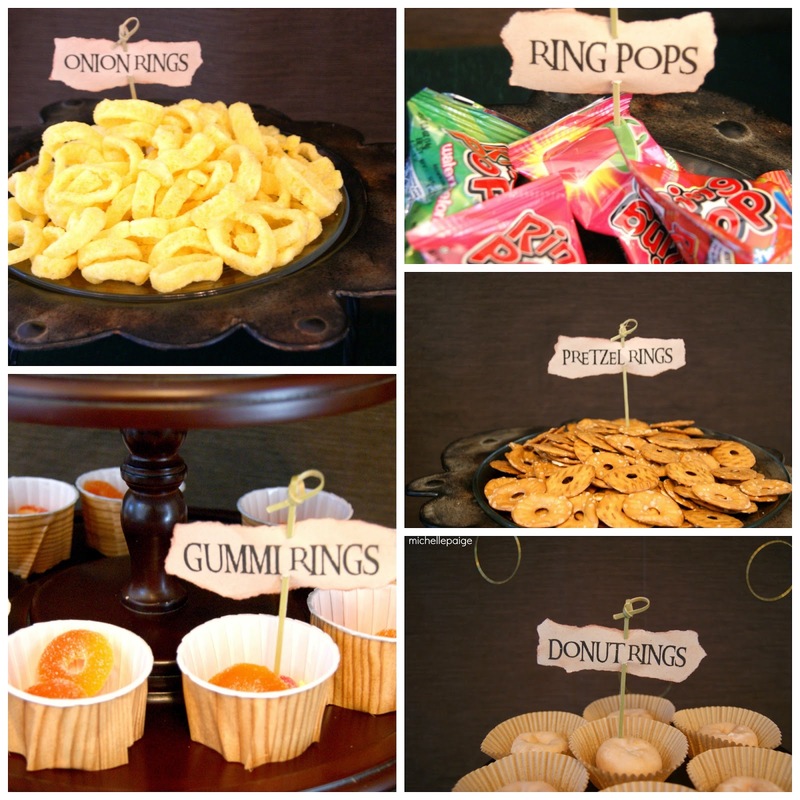 Onion ring chips, gummi rings, donut rings, pretzel rings and of course Pop Rings were included. I covered the white nut cup containers with faux wood contact paper. Bamboo picks were used to hold the food labels. The gold take out boxes (from the Dollar Tree) were the perfect container to load up with treats. Plastic daggers (we called them axes to go with the Dwarves' weapons from the story) were purchased at the Dollar Tree. 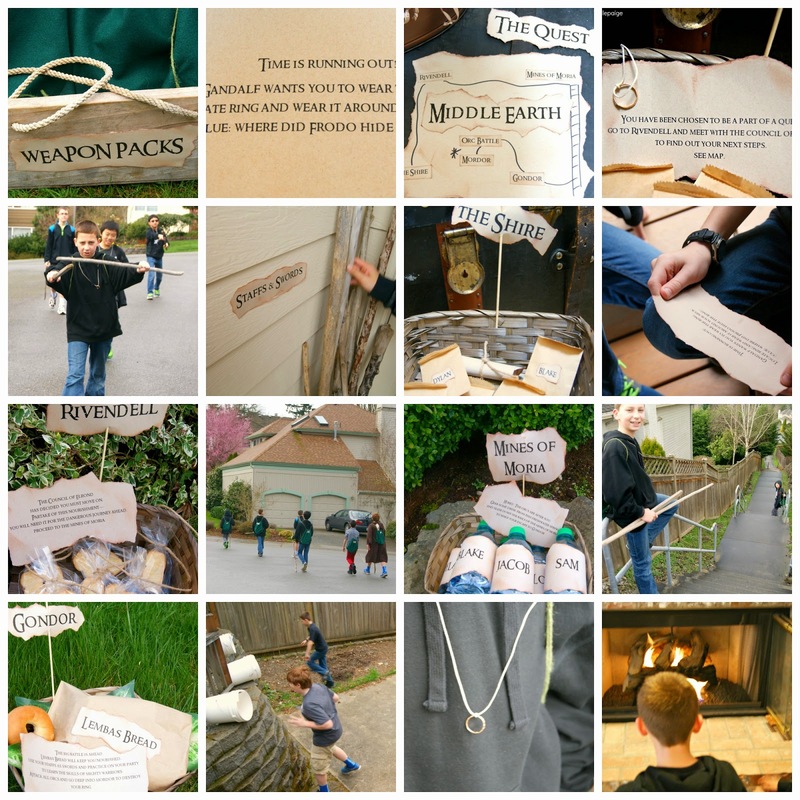 Each kid practiced throwing their dagger at the Orc buckets. 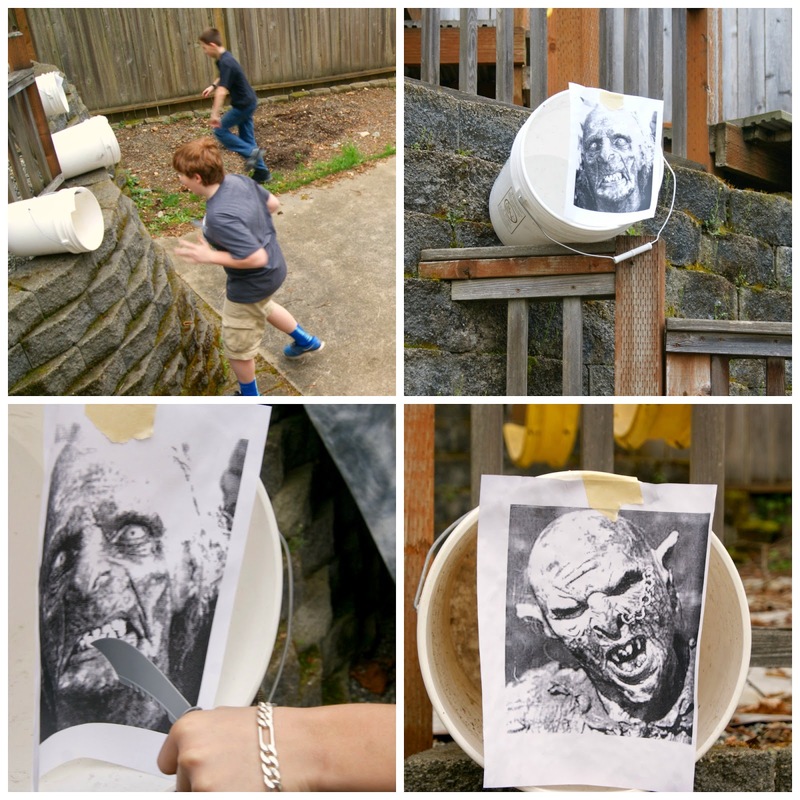 We printed out 'very' ugly Orc pictures and taped them to the front of each bucket. The buckets were placed around the yard at various heights. 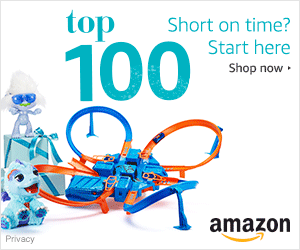 Our leveled backyard was perfect for this! The goal (of course) was to destroy the Orcs by throwing the dagger into the buckets. After all this great weaponry practice, the boys were ready for their Quest. I couldn't find packs to buy, so I made my own out of felt. 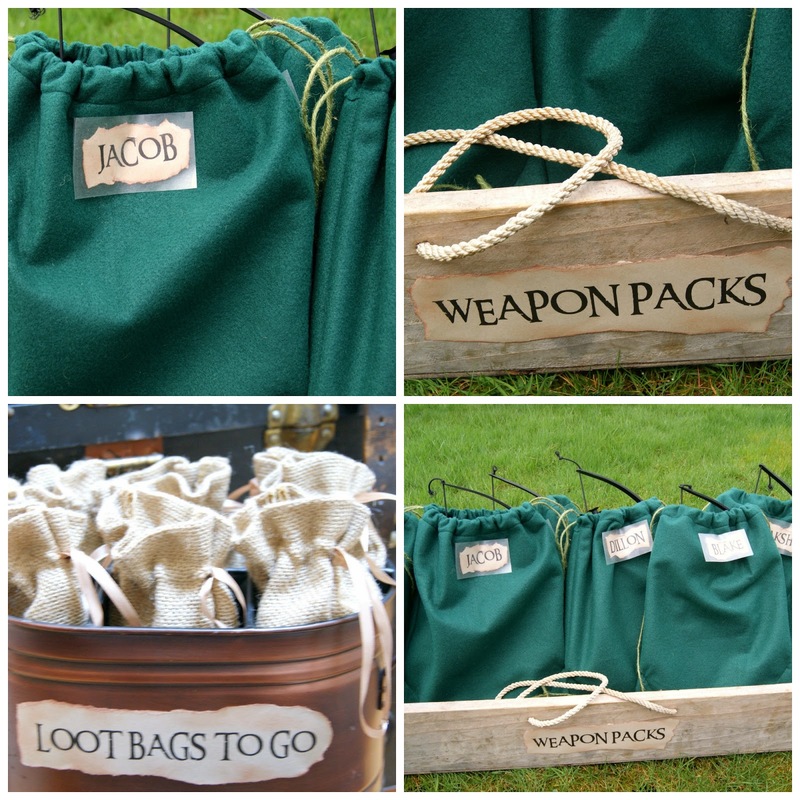 Each boy was given a backpack to hold their bow and arrows, daggers and treats. 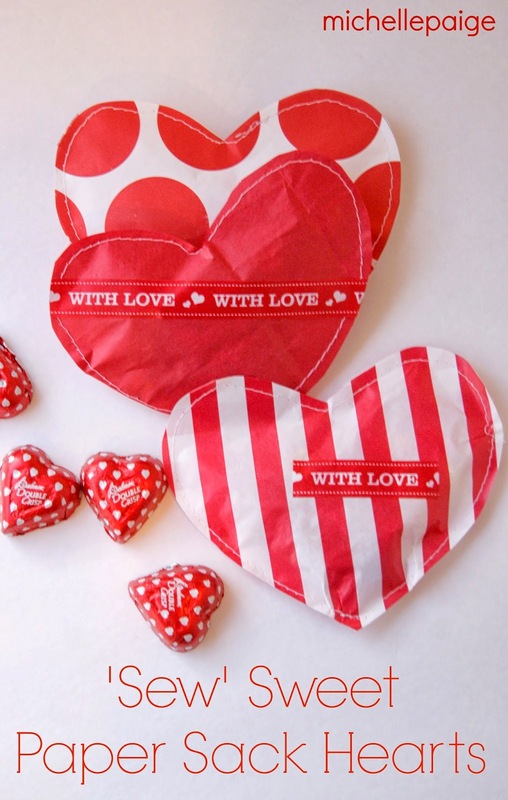 The packs were very simple to make using my sewing machine and lots of green twine. AH (Awesome Husband) and I made a map around a portion of our neighborhood. 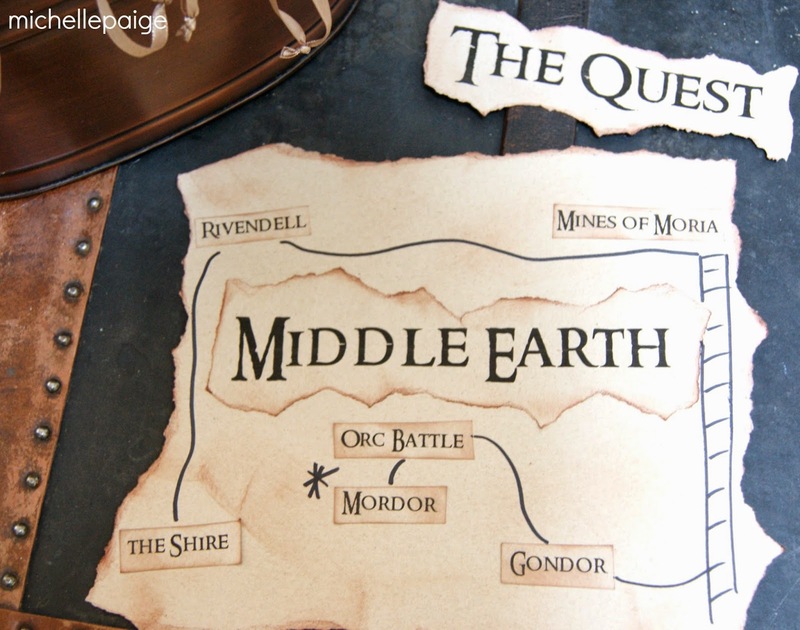 We chose various locations from the Lord of the Rings stories for the marked points. The first clue was to find the ring (it was hidden in the old trunk) and then wear it on their Quest. 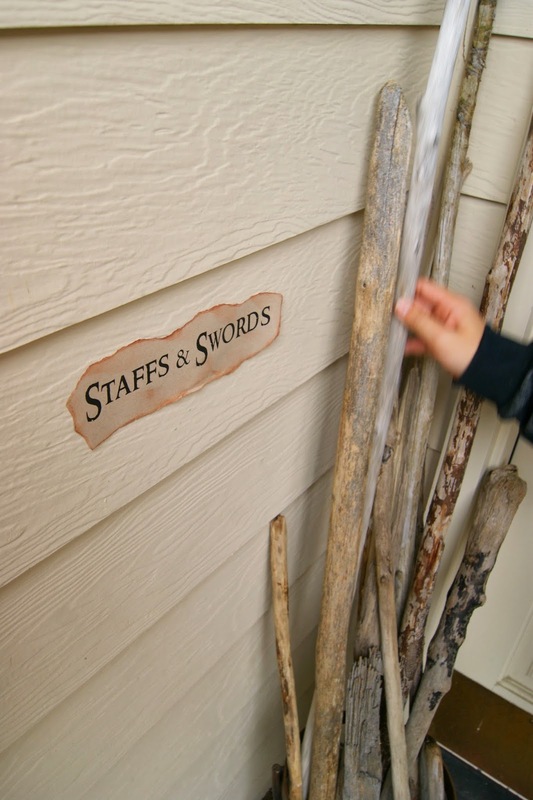 They set out carrying their packs and choosing a sword/walking stick for their journey. AH and I followed the boys in the car, taking pictures and setting out baskets of directions at each marked location. 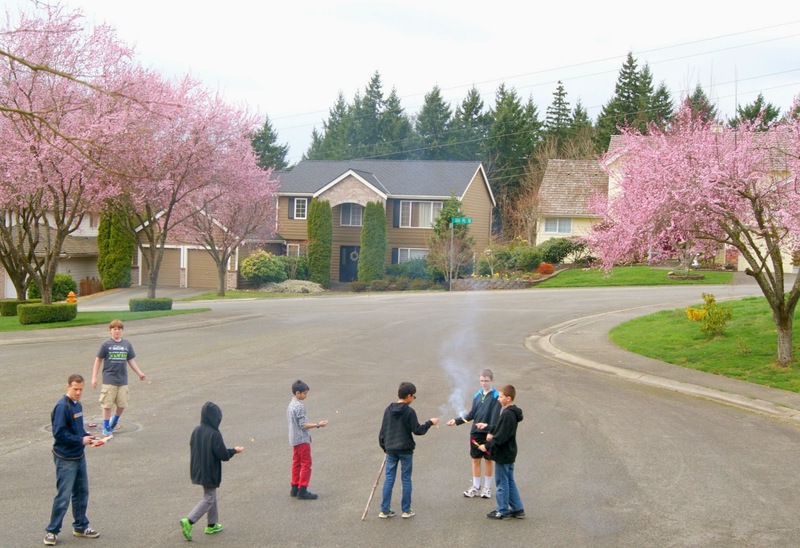 It was quite the sight to see a gang of boys walking down the street carrying sticks! At Rivendell: The Council of Elrond told them they must be on their way. Elf cookies awaited them. At the Mines of Moria: Water bottles were ready as they slid down the mines 'stairway rails'. since the Orcs were waiting for them ahead. Orc Battle: Orc buckets in the backyard were ready to battle. Mordor: Our Fireplace-- the boys destroyed their rings by throwing them in the fire. Of course the kids were ready for more food after that journey! Hobbit Houses: Leggo Waffles with a pineapple ring for the door. Eleves' Fruit Arrows: Cut fruit threaded on skewers. Just like Hobbits, the boys had no trouble finishing their food. And then it was time for cake. 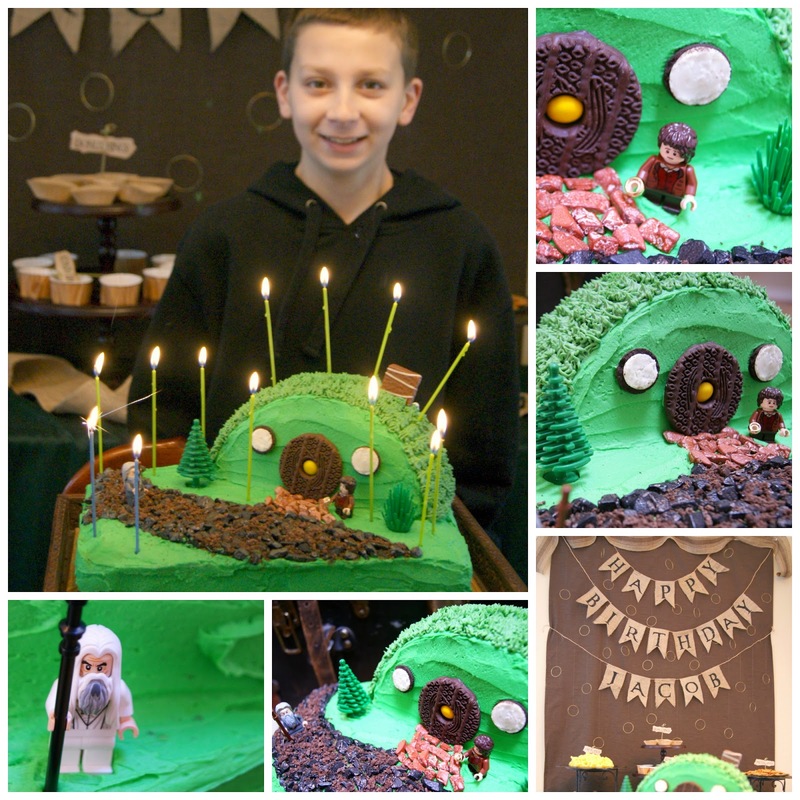 A Hobbit House cake with Lord of the Ring LEGO minifigures. 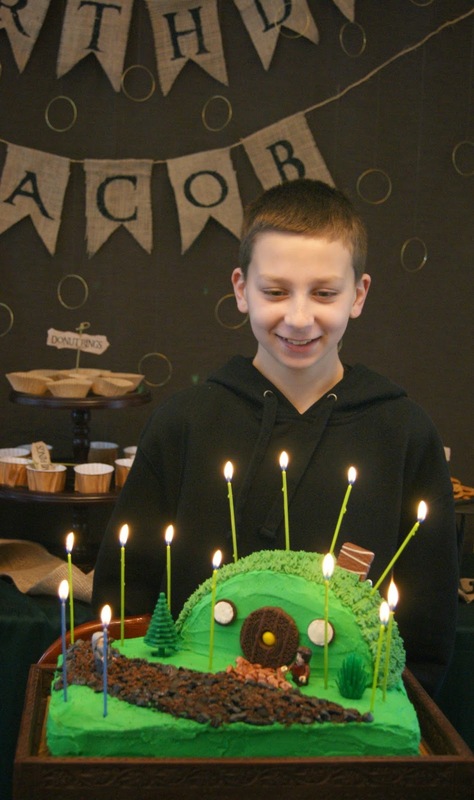 I made a double layer sheet cake with a round cake cut in half for the hobbit house. The pathway was created with candy rocks and cookie crumbs. Door: fudge striped cookie with a yellow M&M. 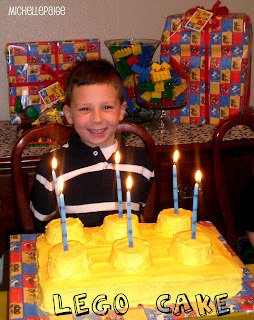 My kid was pretty excited about his cake! 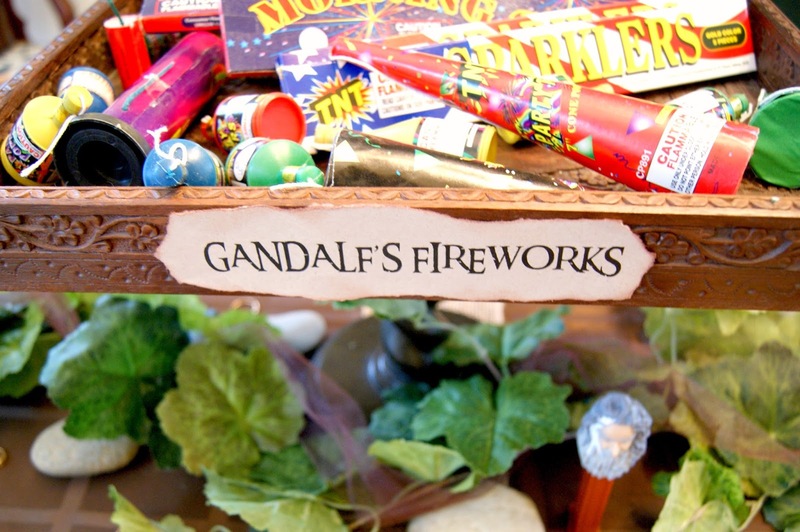 If you're a fan of the Lord of the Ring series, then you'll understand why we had to finish the party with Gandalf's fireworks. Thankfully we had some leftover fireworks from July 4th. Now, that's the way to end the party....with a BANG! 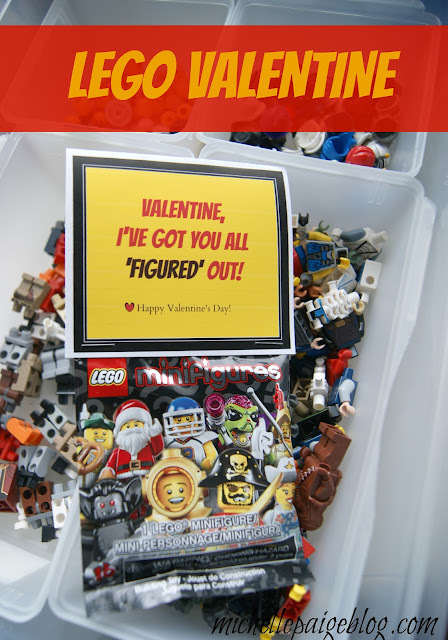 Later when I asked my son which part was his favorite he replied, "All of it!" Want to see more of my son's parties? Click here for the Spy Party. 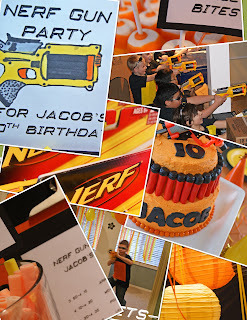 Click here for the NERF gun party. Oh Michelle....this is your best party yet!!!! 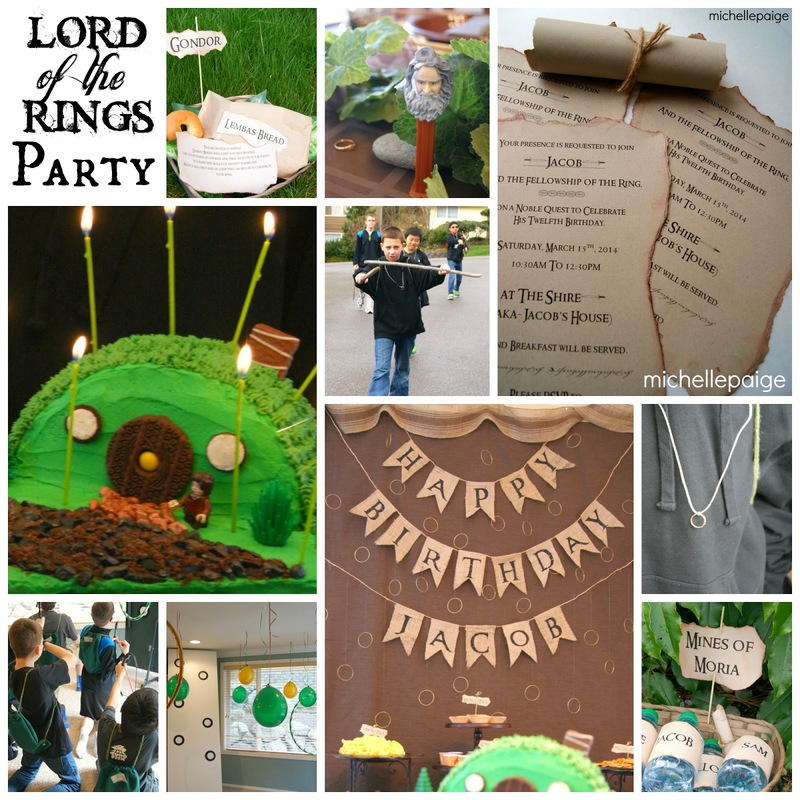 So many clever and creative touches...we should be seeing this party soon on Kara's Party Ideas, HWTM and Spaceships and Laser Beams! Love!!! Oh my goodness! What a great party! I can see how much fun the boys had. 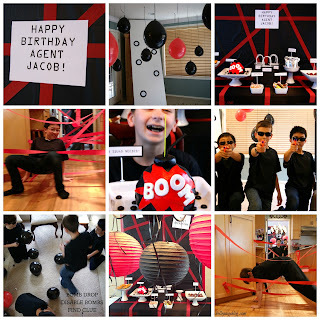 I'm sure Jacob will remember this party for a long time. Holy hobbits (that's about the extent of my knowledge on these movies)! Very impressive. 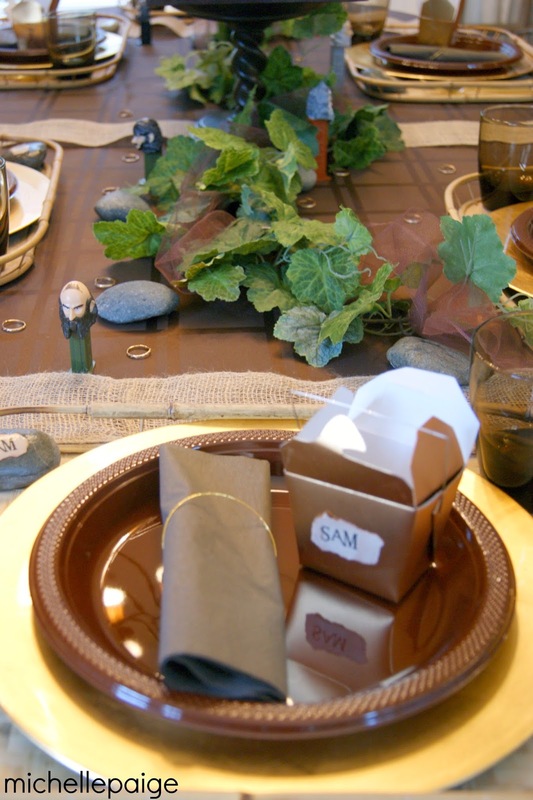 My favorite details were the invites and the rock place holders! I also like the rings on the burlap banner. 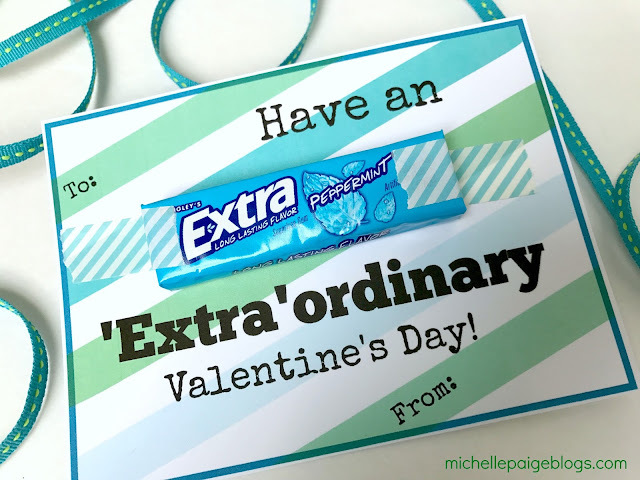 Your parties are always so fab! 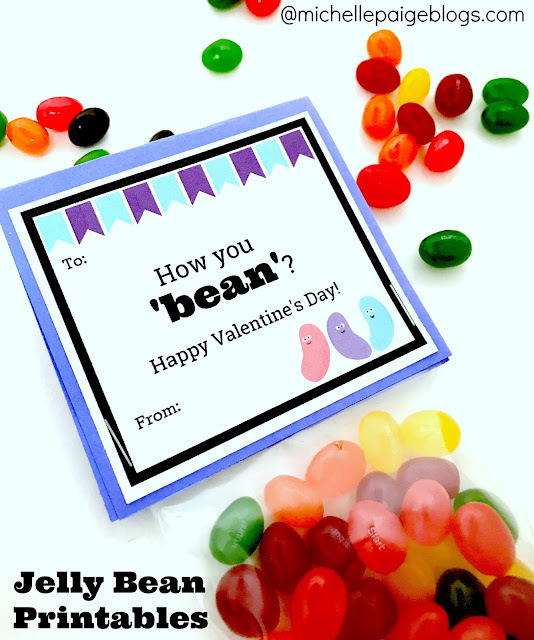 I can see why your kid's friends love them! 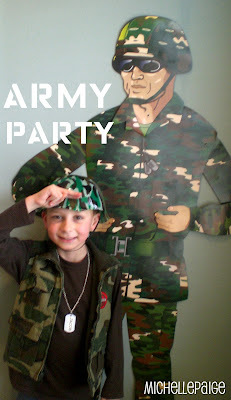 Michelle this is so great that I shared it with my family on FB who have kids that I think would love a party like this. 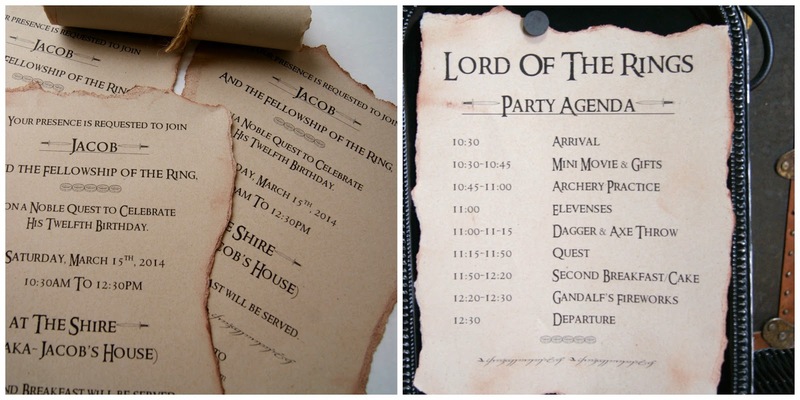 Your attention to detail in all aspects of this party were wonderful. 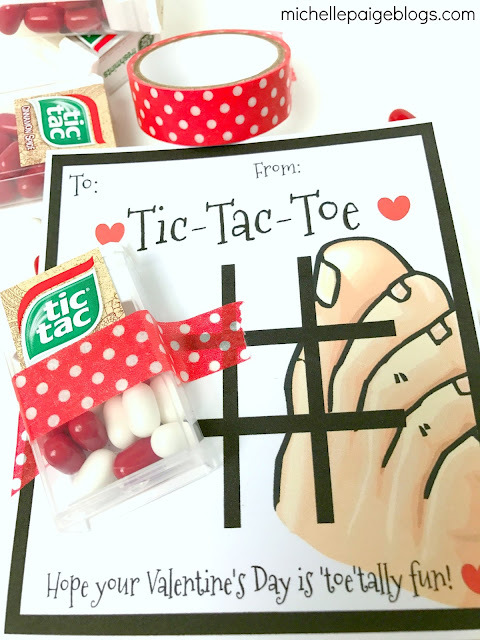 I would have loved ideas like this when my kids were growing up. Great job! I've seen the movies but only read The Hobbit, not the trilogy. I know a few of my friends would love this party now though and they are in their twenties! I like the ring food you served in the beginning.